I was delighted to be able to hook up with a couple of ukulele players extremely well known in the community - Phil Doleman and Ian Emmerson of 'The Re-entrants'. 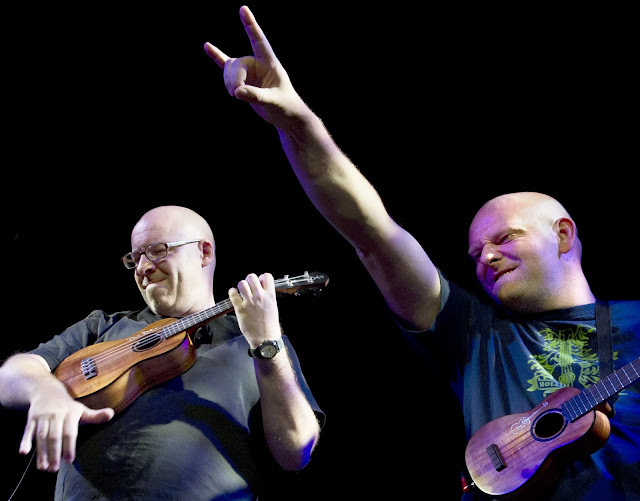 Formed in 2007, Phil and Ian are hugely popular on the ukulele circuit and are a damn hard working pair of guys having performed hundreds of gigs across the UK and Europe including The Acoustic Festival of Britain, and such venues as Leicester Square Theatre in London, and the O2 Acadamy. Together with several TV and radio appearances and five CD's under their belts, this is a full time job for each of them. Their act sees them playing anything from Motorhead to Lady Gaga, wringing solos, arpeggios and riffs out of nothing more than two ukes. 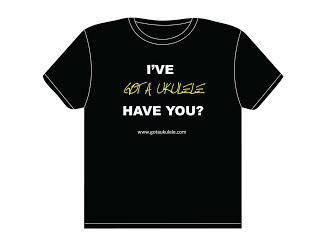 George Hinchcliffe of the Ukulele Orchestra Of Great Britain said of them - "Their act is so very strong: they transcend the limitations of the ukulele". High praise! I've not (yet) seen them live, but come across them regularly online through their videos and the appeal is clear to see. And why "Re-entrants"? 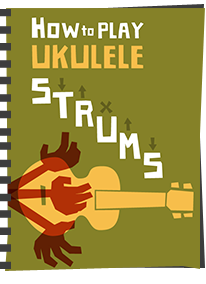 Well for those new players who read this blog, standard ukulele tuning uses a 'High G' on the fourth string and that sort of tuning is called re-entrant tuning. An inspired band name! Hi guys - so, tell me about your backgrounds and your earliest musical memories. Phil: Apparently I had a ukulele when I was about 3 (I don’t remember it, but I do have a photo of me playing it! ), and I had a Spanish guitar from about the age of 8. I didn’t really do much until I was fifteen when I took up bass guitar, and then I took guitar lessons about a year after that. At 16 I joined my first band and have been performing since. Ian: My elder Brother was in a punk band, and when he went out, I would noodle around with his guitar, learning by ear and without his knowledge. By the time he found out, I could play a bit, so we formed a rock band together. I continued after that band, playing in original and covers rock bands, as well as in a 10-piece soul band. I had a long layoff from playing live, before returning to performing with the Re-entrants. 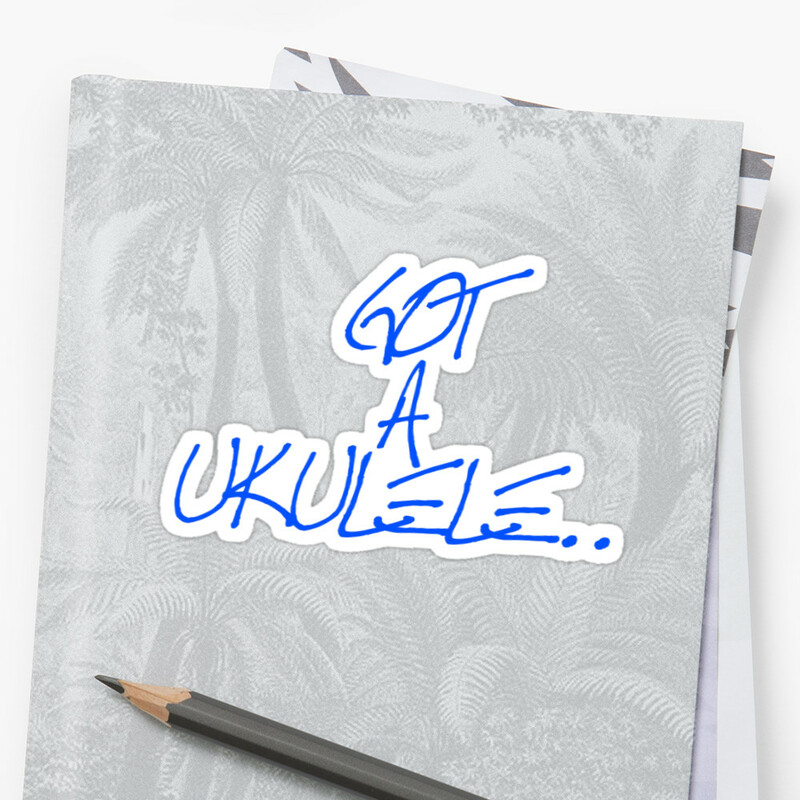 What made you pick up your first ukuleles and did you find the transition to the small uke easy? Phil: Like many guitarists I’d always toyed with other stringed instruments (mandolin, banjo, dulcimer) and when my first daughter was born I thought it would be a nice gentle instrument to serenade her with! For a while I just treated it as a small guitar, but it didn’t take long before I started to see its potential, and the benefits of the high 4th string. I then made a conscious effort to stop thinking in guitar terms and to learn the uke as an instrument in its own right. 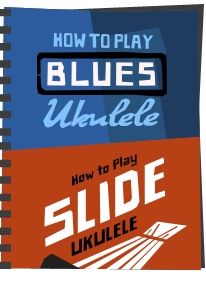 People sometimes assume we play the uke for ‘novelty value’ and play the guitar the rest of the time, almost like the uke is a stage prop, but that couldn’t be further from the truth. We both think of ourselves as uke players nowadays and rarely play the guitar. Ian: Because I played guitar, someone bought me a ukulele as a joke Christmas present. It was a revelation. I’d always thought: ‘Wouldn’t this be so much better if it were a lot smaller?’ and all of a sudden, it was. Within a very short time, the guitars were gone. The size was never an issue at all. I love the soprano scale, and am confused when people say it’s too small for their big fingers. It’s not a miniature guitar; it’s a full-sized instrument in its own right, designed to be played by fully-grown people. That false impression that it’s a shrunken version of something else isn’t helpful. How did you guys first get together as an act? Ian. In April 2007 we met for a jam and realised we had similar taste in music (we both made a list of 20 songs we wanted to try, and 13 of them were the same! ), and when we played together it just seemed to click. At that point we decided we didn’t need any more players and that it would be more fun to try and see what we could achieve as a duo. Having similar tastes in music is certainly helpful! Are there any songs you have disagreed on - any guilty pleasures? Phil: I can’t think of any. We have a rule that any song has to be familiar to the majority of the audience, so no obscure album tracks. As for guilty pleasures, I don’t agree with that concept: if you like something, listen to it! I have been surprised by how some songs, when stripped back to their bare essentials, turn out to be great (‘...Baby, One More Time’ springs to mind). Ian: I think in the earlier days, songs would crop up that one or other of us was unconvinced by, but everything is given a fair crack of the whip. Songs that one of us feel aren’t working tend to be conveniently ‘forgotten’ during rehearsals, and end up discreetly withering on the vine and dying of neglect. The audience has the casting vote in some respects though – sometimes a song you’re convinced is a corker, that you’ve spent a long time on, doesn’t really hit the mark with the audience, and it’s only after it’s been gigged a while that it starts being left out of the set as inappropriate, and quietly disappears. My favourite Beatles song is ‘I am the Walrus’, and it’s the most complex song in our set; it took months to get right. Then you find it only appeals at certain gigs, and it’s only sheer bloody-mindedness that’s kept it in there. We worked too hard on it to let it go, but it rarely gets an outing. As to guilty pleasures, any piece of music has equal chance of being stuck in my head, whether it’s a Beethoven piano sonata or the tune from the Cocopops advert. It’s all music, and everything has something interesting and engaging about it. As I said, though, the audience is a third member of the band, and you have to think of the set as a coherent, cohesive whole. Some things just aren’t appropriate for our show, but that is never a qualitative judgement. How did your first ever gig go? Phil: We played at a garden party in the June, really just to see if everyone else would enjoy what we did as much as we did. They seemed to- the host asked people to donate money to cover our petrol and we left with a uke case stuffed with money! Ian: It had been some time since I’d gigged, and I was so nervous I had to get Phil to do a short set on his own before I could get up. Do you still get the nerves? If so, how do you deal with them? Phil: No. I used to get so nervous on stage that I would shake, especially when I first started doing solo gigs. I didn’t really deal with them, it was more of a case of keeping on gigging more and more until it became something I was so used to it didn’t bother me anymore. There’s a difference between nerves and adrenalin though. At the ‘big gigs’ I usually get a bit of a rush just before going on which can make you feel like you’re ‘nervous’, but again I have just learned to enjoy the feeling and go with it. Ian: Not any more. I get the adrenalin, but that feels like a normal state to be in now. It certainly wouldn’t adversely affect me. I actually find the ‘being on stage’ bit the least nerve-wracking bit of gigging. Possibly, it’s the most relaxed and comfortable I am in life generally. In life, you’re ricocheting around, improvising constantly, in unfamiliar surroundings; onstage, you know what you’re supposed to do, you know how to do it; you’ve done it many times before. You know the material works, because they were all massive hits. There’s always the possibility of the unexpected, but disasters are never particularly traumatic or difficult to fix, and tend to fall between fairly tight parameters. The only two unknown quantities are the audience and the potential for technical problems, and there’s a fair amount you can do to guard against either being totally disastrous. If I was on my own, however, playing stuff I’d written, I’d be paralysed with fear I reckon. What are your lows and highs from touring with the band? Phil: The highs are too many to count- we have a lot of fun doing this. Personally though stepping out onto the stage to an audience of over 1000 at 53 degrees in Preston was pretty special. Off stage, jamming with James Hill was pretty cool, too! Sometimes though the best highs are unexpected, such as playing a small venue to a crowd that you think might be hard work and suddenly having them go with you, really get into it, and have a brilliant night. Aside from the playing we both laugh a hell of a lot, which can’t be bad! Lows have been few and far between, and as we stay busy it’s pretty easy to shrug them off and move on. Ian: Signing bits of women. No, that sounds wrong. The bits were still attached and the women were fine. I still get a kick out of being familiar with so much of the country now. Also, the odd moment of clarity when you’re in the middle of things and you suddenly realise what you’re doing, and how surreal it all is. As to lows, Phil’s bang on. My readers are always keen to know what ukes people play - what's in the collection - any particular favourites? Phil: I have a pair of Pete Howlett Uklectics (solid body concert scale electric ukes) that are my main stage ukes, plus a lovely koa concert also made by Pete that I won in a raffle at a ukulele festival! Of course I have my signature model aNueNue, which is very special, and 6 fantastic ukes in various shapes and sizes made by Rob Collins at tinguitar.com. I also have a couple of other luthier-made sopranos (one by Simon Bush and another by Steve Caldwell), a 1930s Slingerland banjo uke and most recently an Ohana electro-acoustic concert, which I’m very impressed with. ‘Favourite’ is difficult- on stage I feel most at home with my first Uklectic as I’ve been gigging with it since the very beginning, but at home I find I most often reach for my Tin Guitar meranti soprano or the Howlett Koa concert, depending on what size I feel like playing. 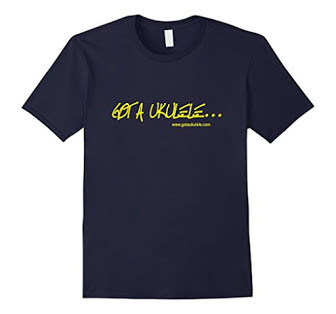 Uke players are spoilt rotten nowadays- you can pop into your local music shop and choose from a wealth of great ukes. When we first started we had to order them from Hawaii! Ian: I’ve got 20-odd ukes nowadays. For gigs, I’ve always played Applause UAE-20s, and I’m unlikely to change in the near-future; they’re resistant to blood, sweat and beers, being kicked, sat on, frozen, baked, dropped; they sound fine electrically and acoustically, and they’re eminently replaceable. My absolute favourite home uke is my Kiwaya KTS-7, which is the one I’d rescue if my house was on fire. I’m not usually very precious about ukes, and mistreat them terribly. I don’t have a uke without a scar or a lump out of it somewhere, and I’ve been known to saw bits off that get in the way. I don’t own any tenors or concerts; they’re sizes I don’t really get on with. I have at least a dozen sopranos, half a dozen sub-sopranos and a few baritones – baritone is my second favourite size. I’ve got some lovely handmades by Rob Collins, Simon Bush and Argapa, as well as my Anuenue, which are all brilliant, but I always feel a little bit guilty when something someone took care over gets trashed in my hands. In some ways, I like the anonymity of the replaceable, cheap, breakable, disposable factory uke. I don’t picture a weeping craftsman if I accidentally step on it. I think you are right Phil - the choice these days is huge and I think the quality is going up at the lower end as well. There are still pitfalls though so do you have any tips for new players on buying an instrument? Phil: Whenever I pick up an instrument it has to 1. have good intonation and 2. a low action (or enough spare saddle to be able to lower it) otherwise it goes straight back on the shelf. After that the bottom line is that it has to feel and sound right to you. Get the best instrument you can afford, but bear in mind that the most expensive one might not be the best! If you’re buying on the net, but from somewhere with a good reputation and who actually know about ukes. 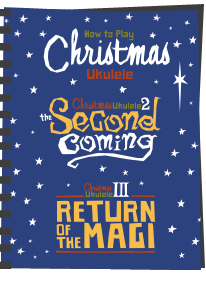 Here’s a top tip if you’re buying in a shop- when you’ve decided on a uke, don’t let them go and get another one that’s in a box from the back of the shop- buy the one you played! Ian: That’s all very sound advice. The one thing I’d add is that the quest for the ‘Holy Grail’ instrument is pretty much futile. The great all-round perfect uke is a myth. I have some very expensive ukes that are brilliant for some things, and not so brilliant at other things, and I have some cheap ukes that I could say exactly the same for. 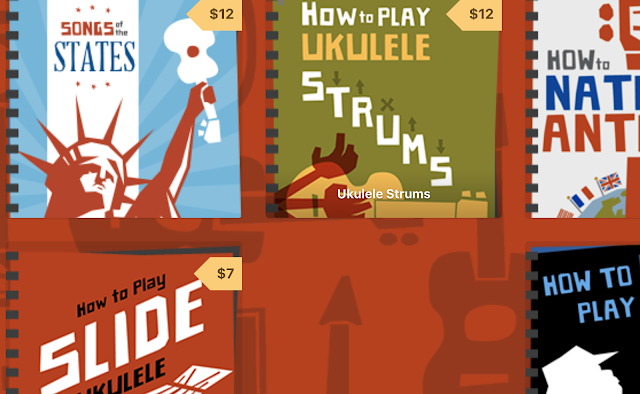 I don’t know anyone who bought one uke, thought: ‘Perfect’ and never bought another. I don’t know anyone who has only one uke. The moral of the story is don’t put all your eggs in one basket, because you WILL be buying other ukes. What are your plans for the band going forward? Phil: We want to keep moving up in terms of the audiences we reach, but also we have to bear in mind this is our living so we can’t be too precious about the gigs we play! That said, at Easter we played our last ‘free entry’ gig and are now starting to play theatres and arts centres. We really can’t expect people to pay for tickets for one of those gigs only to have us play for free at the pub at the end of their road! We did a small experimental tour of ticketed venues early in 2012 and sold out every date, so we took that as our cue to take the leap. We’ve now got 9 theatre dates booked for the autumn and we’re already booking more for 2013. It’s a change in our way of working, we have to think of ‘putting on a show’ rather than just ‘doing a gig’, and it’s also harder in terms of the business side of the band (I’m currently drowning in contracts and posters, it’s almost like having a real job!) but it’s worth it for the nicer venues and bigger crowds! Ian: Phil is in a massively unenviable position working with me. I do practically none of the planning or organizing and have no real ambition or clear idea of where I want to be, yet still make a lot of demands about where I don’t want to be. I’m a spoilt child really, and I tantrum if Phil commits me to anything I’m not so keen on. I bully him a bit, and I think it’s made him a bit more circumspect when it comes to considering options. He’s developed an instinct for knowing when I’m likely to turn something down – something I’m far more likely to do than him. I’m not a diva about it – it’s just that the only aspects that engage me are playing and performing, to people who are on the right wavelength. Chasing money or reputation doesn’t interest me, and the business side bores me rigid. We joke about the fact he just drives me to gigs, points me at people, I play, get back into the car and get taken home. But there’s a lot of truth in that. I have no real ambition; I’m just enjoying the ride. I like not knowing. I ask this of everyone I interview - as a it's beginner’s blog - what is your best tip for new players? Phil: I teach quite a few beginners ( https://www.facebook.com/Learntoplayuke) , and whilst I encourage them to appreciate the fact that the uke is very easy instrument to get past the ‘sounding horrible’ stage on, that doesn’t mean you have to stop there. The more you put into the uke, the more you get out of it. Oh, and play with other people. Ian: Play. Use your ears, and learn how the thing sounds and is supposed to sound. Listen to music; try to play along. Your ears are more important than your hands, and your hands are way more important than your theoretical knowledge or reference library. There’s no teaching tool out there as effective as time spent with the instrument in your hands and your ears open. Playing + listening + time = playing well. 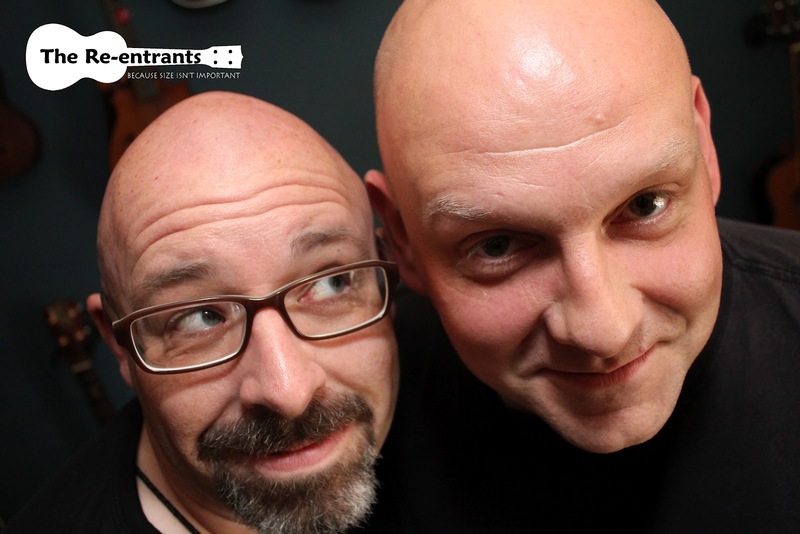 Thanks so much to Phil and Ian for talking to Got A Ukulele - if you can get a chance to see them on their forthcoming UK tour - get along and give them your support! STOP PRESS! Since doing this interview, Phil and Ian have changed direction. 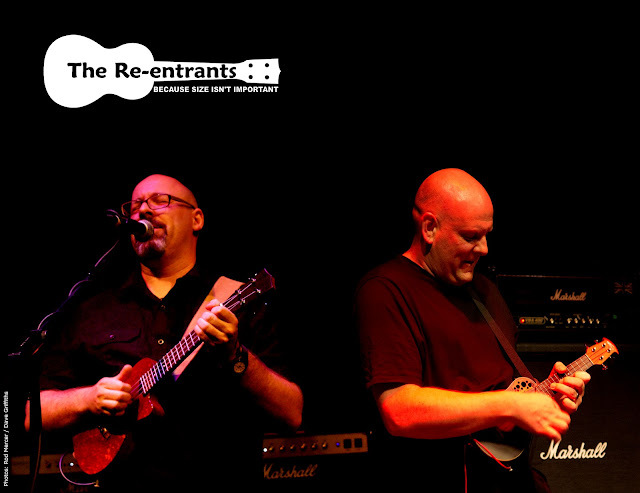 2012 saw the last of the Re-entrants shows and they are now performing and touring as Phil Doleman and Ian Emmerson! Watch Phil and Ian below! I love the fact that they're touring professionals and yet prefer the smaller sizes. Otherwise, all the pros seem to play with tenors.